I resort to making soup when I’m facing a deadline with my book. I’ve documented what has become a ritual in a post I wrote exactly two years ago. I’m planning to start a total review of my manuscript before I hand it off to the line-by-line editor. (Yes, the end is in sight!) But, before getting started, I’m going to take a break. I don’t call this procrastination but honing in on my creative skills by using a different outlet—making soup. Warm, fragrant liquid that perfumes my kitchen, soothes my anxiety and wakes up my senses. While writing my book I have made the following soups: broccoli and cheddar, lentil with frankfurter, black bean, potato and leek, chicken noodle, gazpacho and my favorite, butternut squash. Today I am tackling French onion. The recipe that I will try for the first time comes from Jacques Pepin. He uses chicken stock (instead of beef) and incorporates egg yolks and port after the soup is cooked. I will forgo the eggs and port. After going through the mechanics of cutting, frying, toasting, stirring, shredding and ultimately tasting, I will feel ready to plug away at my writing with renewed enthusiasm. 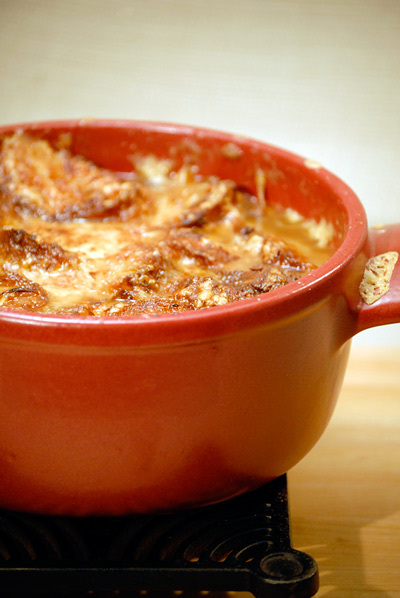 From the Lyon region of France, this onion soup is much thicker than the usual kind. It’s often served as a late-night dish. When I was a young man, I often made it with my friends at two or three A.M. after returning home from a night of dancing. The soup is strained through a food mill and put in a large tureen or casserole that goes into the oven. Once it is baked, egg yolks and port are mixed together in front of your guests and poured into a hole made in the center of the cheese crust. Then the whole soup is mixed together — both the crust and the softer insides — and served in hot bowls. It looks thick and messy, but it is delicious. Arrange the bread slices on a cookie sheet and bake for 8 to 10 minutes, until browned. Remove from the oven and set aside. (Leave the oven on.) Melt the butter in a large saucepan. Add the onions and sauté for 15 minutes, or until dark brown. Add the stock, salt, and pepper. Bring to a boil and cook for 20 minutes. Push the soup through a food mill. Arrange one third of the toasted bread in the bottom of an ovenproof soup tureen or large casserole. Sprinkle with some of the cheese, then add the remaining bread and more cheese, saving enough to sprinkle over the top of the soup. Fill the tureen with the hot soup, sprinkle the reserved cheese on top, and place on a cookie sheet. Bake for approximately 35 minutes, or until a golden crust forms on top. At serving time, bring the soup to the table. Combine the yolks with the port in a deep soup plate and whip with a fork. With a ladle, make a hole in the top of the gratinée, pour in the wine mixture, and fold into the soup with the ladle. Stir everything together and serve. Yum. I’ll be right over. Congrats on getting to this point with your book. Thanks, Lois. I’ve set a place for you at the table.